we really enjoyed the healthy southwestern quinoa salad that we made last week. we took it to work all week for lunch, and it was delicious. this week, we were looking for another healthy salad recipe, and we were happy that we found this one . 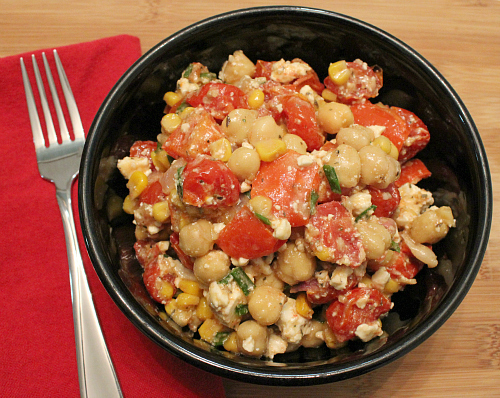 . .
this roasted vegetable salad with chickpeas and feta cheese is a delicious healthy salad for lunch. the roasted vegetables give the salad a deep and rich flavor that combines perfectly with the mild chickpeas and the salty feta cheese. the honey adds just the right amount of sweetness to balance out the vinegar in the dressing too. this salad is great for keeping you full and satisfied while still keeping your diet on track! preheat your oven to 400 degrees F. on a large cookie sheet lined with aluminum foil, combine the grape tomatoes, red bell pepper, red onion, corn, and garlic. drizzle 1 tablespoon of olive oil over the vegetables and season with ground pepper. toss to make sure that the vegetables are evenly coated. roast the vegetables in the oven for 30 minutes. once done, remove the roasted vegetables from the oven, and allow them to cool completely. 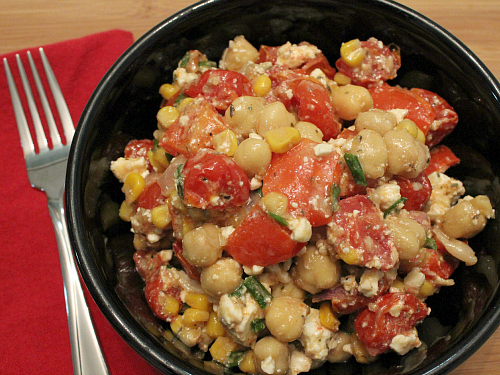 in a large bowl, combine the roasted vegetables with the chickpeas, feta, and chives. in a separate bowl, whisk together all of the dressing ingredients. pour the dressing over the salad and toss to make sure that the salad is evenly coated with the dressing. refrigerate and serve cold. Looks good! If you like chickpeas, I have a good recipe for Morcoran Stew (no meat). It would be nice and warm on these cold days with a nice piece of bread. now this looks yummy! 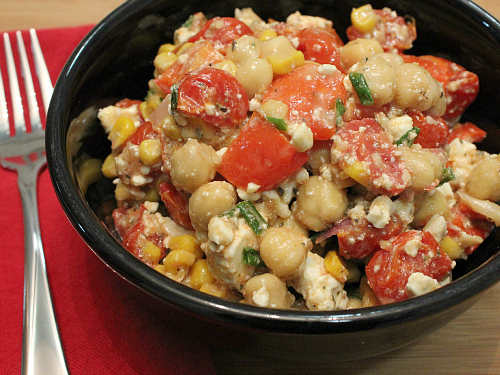 i have been wanting to cook with chickpeas lately and will def have to try this recipe!